Also published at medium- Profit Trailer bot review, ultimate Profit Trailer Settings. Bitcoin cryptobot that makes lots of money! Profit Trailer- Bot review, ultimate Profit Trailer settings. Bitcoin Cryptobot that makes lots of money! Profit Trailer- review, settings and ultimate strategy guide. This article is the ultimate guide to Profit Trailer on the internet. No one else has provided as much information in one go about what it is, the different settings, and how to use it effectively. I am am an experienced botter and trader and have far more knowledge than most users and have conducted hours of tests as well as analysing price movements and hundreds of charts. This is pretty much everything you need to know to get you to make money with Profit Trailer stripping away the mystery and showing you what a devastingly powerful tool it can be, plus managing risk and knowing how to trade with high level security. There are many ways to trade crypto. Some people day trade or are swing traders. There are also people who invest in ICOs. And finally there are people who use trading bots like Profit Trailer. I do a bit of all, but because I’m a busy guy and don’t consider myself a genuine daytrader primarily, I like to use bots to execute most of my trades on my behalf. A few years ago I was trading a little in FOREX and tested a small number of bots. In the FOREX market I found a lot of bots were inconsistent, semi scams or ones that performed well in demo trading didn’t get the same results in live trading, so I left it. Jump forward a few years and having entered the crypto space, I started looking around at Bots again out of curiosity. In particular there were a number of people on Bitcointalk discussing trading bots. The ones I have tested include Gunbot (more about Gunbot another time, Profit Trailer is essentially a fork/evolution of Gunbot), Leonardo Margin Trader. But the best I have ever used is Profit Trailer. I have been amazed at my results and increased my trading accounts dramatically In a way I could never have done if I were actively trading as a daytrader whilst I was still learning unless I was exceptionally experienced from the start. I even had a month where my holdings increased by a factor of over 500% (December 2017) on Binance– from 0.15 btc to 0.85 btc! Edit– I have now uploaded my entire sales log from the month of December 2015 to January 15th as proof. Click on this link- the green highlighted column is the %profit per sale and third column to the right of that is the USD value in terms of profit! Of course you will not have such unusually large gains as often as that (December was definately an outlier), and that huge growth was of course in part due to BTC and altcoins booming in the leadup to Christmas. During bearish times you will of course not be getting such returns but even so in my other primary trading account on Bittrex, which has grown a lot slower I have steadily had gains from 20–50% in most months, and there were even days where I was doing 8–10% gains on Binance. Why bot trading with Profit Trailer? First of all it goes without saying a lot of traders don’t use bots or like the idea of using bots. Is it true that an experienced expert trader could potentially trade better than any bot? Of course. Someone like Warren Buffet would of course laugh at the notion of bots but he also doesn’t understand crypto, and his game is very different. Also there are definately a lot of bad bots out there, and really there are only a handful that actually work. Profit Trailer is one of them and a star performer. People who are experienced successful traders will have their own methods and to be honest don’t really need to change their system if it’s already working, but for the majority of people starting out in crypto trading learning the required knowledge can be daunting (and costly if you are rash or don’t know how to manage risk). However using Profit Trailer has distinct advantages, especially for someone who is not very experienced in picking manual trades, and is also a very handy tool/compliment for intermediate traders. 1) A human cannot be awake 24/7. A bot can run on a Virtual Private Server (VPS) and monitor hundreds of currencies and trade without ever stopping unless you tell it. Some of my best sales come in the middle of the night when I am asleep and the Asian markets are alive and I wake up to see some amazing sales. 2) A bot is emotionless. Once you give it parameters, it sticks to them. A human will have emotions. All but the best traders who have honed years of discipline and stick to the rules will not be able to do this and make rash decisions rather than logical ones. The bot will consistently do what you tell it to without fail. 3) Consistent steady profits. Unless you are a truly experienced expert trader you will mostly likely make bad decisions, and may lose money or fluctuate your trading balance a lot. I have made a big profit nearly every month I have used Profit Trailer- the sole exception being the January/Feb crash, and I have survived numerous other altcoin crashes which were not as extreme and come out with more in the end once the market stabilises, and my trading accounts remain higher considerably than what I started with. 4) A big supportive community all with the same goal of making decent money. Profit trailer has thousands of active users and people share tips, strategies to help newbies, the development team is also excellent and open to new ideas and works to make the bot better consistently. I’ve learnt so much from talking to other experienced traders and botters. Some people who use completely different strategies do just as well as I do proving there is more than one way to win. If you use my referral link for either or both of Profit Trailer or Binance and email me or contact me via telegram I will give you some advice on settings. I also offer a comprehensive coaching service on how to maximise profits with so you get a more detailed understanding of my trading strategy with PT and I will show you my exact settings. 5) Detailed monitoring of profits and account balances. Profit Trailer has a very detailed log of your buys and sells including a calculation of the USD of your account, sales, daily, weekly profit amongst many other things. There is also a possible buy list, which are alts getting within buy range. Your current buys will be listed so that you can see at what% up or down they are since purchase price. PT will show you the exact buy trigger prices where it would make potentially make a buy, thus there is a strong level of transparency into how it works as you can tweak settings live and see what difference your tweaks make. I do add though that of course not every one gets the profit margin I and some of the experienced users do, but I firmly believe on default settings you will make money in normal and bullish market conditions. The difference is I spent a lot of time looking at live charts- I use both Coinigy and Trading View and have professional accounts with them and have a good understanding of how prices behave an the relationship between the candlesticks, indicators and buy strategies and have done a lot of tweaking. I also spent a while testing smaller amounts with different settings and have come up with a formula which is extremely profitable, and even when the market turns, it turns defensive and is much more cautious about using the Averaging Down (Dollar Cost Averaging/DCA) feature (more about that later. I also have some failsafe nuclear options (more on that in the risk management section) if the markets implode extremely (this would be on the scale of the January crash we saw or a Mt Gox style meltdown). My settings with only a little tweaking will be enough to survive a lot of mini crashes and corrections though. Your account will fluctuate of course- an analogy I would use is like a big elastic band, during a downtrend your entire portfolio will contract, and as soon as the bulls return it will expand and explode upwards- as long as you know what to tweak in what market conditions, and remain calm when you see lots of red you will win long term. Obviously knowing how to set the bot up and optimise it and what precautions to take in different circumstances is vital in achieving this. Profit Trailer also has a range of excellent safety features to stop trading in certain market conditions. You do have to understand the different ways a bot will trade (more on how Profit Trailer works shortly). How does Profit Trailer actually work? First of all Profit Trailer has numerous strategies you can use to buy. You can also pick pairs individually to trade or filter by volume- I use the volume filter, though I have also manually blacklisted certain coins and blocked PT from trading them which I deem to be worthless shitcoins, on BTRX avoid the likes of CLUB, SLS, BLITZ (some of these may have been delisted since but I blocked them long ago), on Binance a lot of people also seem to have problems with the likes of ICX, LRC, NANO (I have not blacklisted those three but they are known for ruining others accounts who have aggressive DCA settings). A very subtle thing to note about volume is different settings will work better according to the profile of the coins you select. If you pick very high volume coins to trade on only, say 3000 and above these coins will be less volatile. Lower volume coins say under 500 are more volatile. Coins under 200 can be very volatile (but also very profitable if you know how to catch them!). Using Profit Trailer feeder, you can actually dynamically adjust to different buy and sell strategies and settings upon different market conditions e.g. volatility, the downward or upward profile of an individual coin in the last 24 hours etc and create individual coin risk profiles based on upside and downside volatility (see my interview with PTF’s creator, mehtadone for more info. I include advanced training on PTF too in my programme. If you don’t already have it click here to buy. In PT version 2 release (I am now on the official beta testing team) there are far more buy and sell modes plus the ability to combine multiple strategies. For example you can combine a buy condition so that Relative Strength index (RSI) is below 40 (getting oversold), Bollinger bands are in the lower half LOWBB 40 (e.g. 40 or less) and EMASPREAD or EMAGAIN is positive 0.25 (uptrend) on EMA 70 (slow) EMA (fast) 10 (this ema combination means it will make the spread/emagain smooth and accurately mark an uptrend in buy conditions). Relative strength Index, to put it very simply is whether or not a commodity is overbought or oversold. Example: BTC. Note that with lower timeframes RSI creates a lot more noise. Traditionally (and also from personal experience) traders will use longer timeframes for RSI (some swing traders will use 4 hours for example). So if you are to use RSI on 5 minutes on PT I would look carefully at where it buys and sells. The two buy strategies I have used the most are based on Bollinger Bands and EMASPREAD which is based on the % size spread (space) between a fast and slow Exponential Moving Average (EMA). A visualiation of EMASPREAD can be seen below on my Coinigy chart. SMA/EMAGAIN also has huge potential and once I’ve conducted enough tests on it I will be sharing my experiences with it. The white space below the centre line (which is a 20 period EMA) represents a number which is translated into a % space of the fast EMA dropping below the slow EMA. For example using a setting of EMASPREAD at -1 would be making the bot buy where there is a -100% gap where the faster EMA drops below the Slower EMA. The bottom of the spikes in the white spaces seen here would probably represent around figures of -2 to -3. You can also do the inverse, so if you set EMASPREAD at 0.5 it would mean PT starts looking for a buy as soon as there is a 50% positive spread/gap between the fast and slow EMA. I know people that use both positive and negative EMASPREAD and they do well, and having used both I can say they both work, I used both during November and December when both my accounts grew at a tremendous rate. My negative EMASPREAD varied from -0.75 to -1.75 typically. On positive EMASPREAD I used between 0.5 to 1. I cannot say which is better because they have different pluses and minuses and I didn’t split didn’t test them side by side. On Positive EMASPREAD my observation is that PT will follow a coin all the way up an an uptrend, and keep rebuying on pullbacks. One downside is that it will keep buying even as it has peaked, but it should have made lots of buys and sells on the way to the top- to understand this I would look at a MACD peak- which is to be a built in strategy for 2.0- which is lower than the previous peak- so on PT 2.0 there will be ways to limit buys that are not approaching the peaks by using RSI line or STOCHRSI (e.g. buy only below the 30 line) or using PTF upside groups (for example if a coin shows a certain upward threshold- which can be identified by PT Feeder- you may want to restrict buying, which I have done for certain situations as I figure this coin has already peaked- more on this on my future PTF article/video) as a buy trigger/limiter. On Negative EMASPREAD, the bot will countertrend trade, it will follow a coin which is dropping and then buy on a reversal. One downside is that it might just get faked out by a minor reversal before continuing down, I use a large trailing buy number- I have tested anything from 0.5 to 6 to ensure it buys only upon sight of a bullish engulfing candle on a higher timeframe. Having a very large trailing buy figure means it will leave a wide margin to make a buy, without getting faked out I am unsure of the optimum figure but anything from 0.5 to 4.5 seems to have worked for me, this value can also be offset dynamically according to a coin’s volatility or trend (along with many other things) by using Profit Trailer Feeder. E.g. with PTF you can have a default level of say 1.5 and then have offsets in either direction of 100% or more, or you can have a Lower boundary e.g. MinTrailingBuy of 0.15 and higher boundary of Maxtrailingbuy 4 (you can also offset these number in different market conditions with overrides- e.g. downtrend make trailing buy very big, or switch off trading completely if a coin has a big downtrending profile- I will be writing a detailed article on PTF soon, accompanied by the full trasnscript of mine and the PTf creator’s interview). During December I used EMA slow 20 EMA Fast 5 on 30 minutes candles and my trailing buy was set between 0.3 and 0.75. Example of Bollinger bands plus STOCHRSI and RSI on Trading View. The Green Highlights are when RSI is below 40 and the candles are hitting the bottom of the BB Bands. Note that I personally prefer using longer timeframes, when using EMASPREAD (or for that matter any setting)- because I personally feel on very short timeframes the movements are too choppy, and personally I prefer more gradual longer movements for buying and selling however I have also been able to effectively use a scalping type strategy for shorter timeframes- and many people prefer short/sharp fast- (though you do need a very high volume of trades to make it work) more on that later. Also on longer timeframes you are far less likely to be hit by a heavy bag. Try looking at different the RSI line on a 5 minute vs 4 hour timeframe- that is not to say you should not be trading on 5 minutes and be trading on 4 hours- PT won’t trade on 4 hours because it is not a compatible candlestick sizeon BTRX or Binance, but you need to think carefully about a strategy you are picking for a particular timeframe. You will notice that on lower timeframes there is far more noise, so you could also for example use “Takeprofit time” using PTF you can also override and use takeprofit time in a downtrend as an intelligent stoploss or way to dynamically lower your gain number. So the above would mean you take profits after 60 minutes and it has reached 2%. Personally my strategy with takeprofit is that on an uptrend amd normal market, I have it switched off by default (Why exit a position early when it could still run further?) But in a downtrend, slow or neutral market or if the coin starts tanking suddenly I use a set of overrides (they will automatically identify what is going on and act accordingly) with PT Feeder (and in some scenarios takeprofit will act as a stoploss as you can also set takeprofit as a negative number to act in this way). Note that PT’s INDICATORS file where you set the indicator periods and lengths will only sync with whatever candleperiod an exchange allows on its charts- so on whatever exchange you have a license with ensure they have that period on their charts. It just goes to show there are many ways to profit with the bot, you could test using small amounts until you find a method you like. Specifically on the INDICATORS file you can change the Bollinger Band (both length and period), EMA, SMA settings, the default period for BB was originally 1800 seconds, which is 30 mins and EMA slow and fast by default are 20 and 5, so change these accordingly to your style of trading. If you changed it to say 900 seconds (15 mins) and EMAs to 20 and 3, you would get much sharper faster movements, which could be good for quick short sharp profits (scalpers would use this). Using 1800, 3600 (this is my personal preference generally) and changing the EMAs to 30 and 15 will give you much smoother slower movements which are better at riding downtrends and buying closer to the bottom, but you will get less buys and sells. With BB buy you can get it to buy within a range of a BB band on a timeframe. For example buying at BBLOW 15 means you will buy anywhere from the bottom 15% of the lower BB band upwards. If you want an exact visualisation of the buy zone is using EMAspread and LOWBB setup a free trading view account and use these scripts by Helmi, who is an experienced Profit Trailer/Trading View user that I know- he has created scripts for most if not all of the strategies (eventually he will do them all, I know he is working on it!) you will need to need to click on chart, then click on the Indicators, Fundamentals, and Economy button which is a squiggly line highlighted by the red rectangular box below. Then go to a script called LOWBB and HIGHBB for Profit Trailer. Also created by him are EMA/SMA SPREAD, EMA/SMA GAIN, EMACROSS. The thick red line shows the end of the buy zone. You can also use a negative number (this has been one of my favourite strategies in the aerly days) which means it will make a buy outside the bottom of the lower BB band- I have used a 1 hour BB period before because it looks for an extreme low point where sooner or later price will rebound upwards- so on the Coinigy chart you will see where there is a wick/tail at the bottom of the BB band which would be the trigger if you are using LOWBB -1 -2, -5 etc. I have effectively used a 5 minute period BB band using a really large minus number such as -25, -30 -40 and a gain sell level of around 5 in normal/uptrend (more on gain later) which can be good for lots of short sharp scalps by selling quickly on the reversal. On the flip side I have also used positive BB of between 0 to 25, sometimes the price does not reach the bottom of the BB band before reversing so positive BB does have advantages over negative BB- I suggest you look at a number of candle movements in relation to the BB band on different timeframes to get a sense of how prices go. The example above with STRAT shows what would happen with a setting of -20 on 1 hour candles and 20 BB period. You can also use HIGHBB as a buy strategy which means you can catch a coin as it is bursting upwards. Because of the way Bollinger bands work, i.e. they expand during volatile periods, this can be an effective way to catch a pump. On PT 2.0 you can l be able to combine multiple indicators for buy and sell conditions. Because I am on the official beta testing team, I have had the chance to test Relative Strength Index (RSI), STOCHASTICS RSI which are two new strategies 2.0 will have natively, using either of these and combining them with other strategies such as LOWBB, EMASPREAD can dramatically increase the quality of your buys and sells. If DCA is turned on PT starts averaging down (which is buying more of a coin at a lower price if the coin drops to reduce the average cost of the coins you have) when a coin is below a certain % of price dropped- aka the buy trigger number (which you can set- I vary this from around -10 to -20 depending on the market conditions) it will only make a DCA buy based on a second and third criteria e.g. setting it to -3 buy level on a 1 hour BB band, or using EMA or SMA SPREAD at positive or minus 1 or 2, or any other strategy you can also limit the maximum number of times it does this, or allow it to go unlimited (not recommended!). There is is also the ANDERSON DCA Strategy. I would not turn DCA on until you understand what it does or how to tweak it. What I do is limit the number of buy times to 4 or 5 max (the default is 6- which is fine if you are making very small initial buys, but my buy amounts tend to be a little bigger- I tend to use about 1.5-2.5% of my account for each initial trade) as well as make sure it does not start averaging down until bigger drops. A dangerous way (and this is how some newbies can become unstuck) is to have ultra aggressive DCA settings where you have a low buy trigger say -4, don’t change any other parameter beause it may start trailing down to buy as soon as the coin reaches -4 in dropped price, which I think is just guesswork and could leave you with a heavy bag if it’s tanking as it will make a bag disproportionately larger potentially. Anyone who understands markets knows that when the trend changes that’s the time to play very defensive so it makes no sense to have such an aggressive set of buy triggers. To manage risk I would suggest that you do some calculations to work out the amount of your total balance you wish to allocate for a pair to DCA. I set various limits on mine as of course if a coin is crashing, it may not recover for a while, though some of my most profitable trades and biggest sales have also come from pairs that had been DCA’d multiple times and have finished downtrending after the 4th or 5th DCA buy- by then the average price may only be -7% after having been down as low as -40% at the bottom of the market, and a quick recovery and good day follows and it sells for enormous profits! Of course each pair will be at different stages of the market cycle and I watch each of them individually (a small number I may sell at a loss manually). You can also manually stop PT from DCAing on any pair. There is also an automatic stop loss feature for PT which can be turned on. My view is that you should not use both DCA and stop loss, use one or the other. I look at each case individually, and I will only sell a coin if it looks like it’s on a longterm downtrend and not likely to recover soon. One method of DCA which is popular is ANDERSON, where you pre define a number of levels and triggers. This can be very effective if you know how to use it. Let me give you a big tip, do not put your buy triggers to small numbers like Level 1 -2, level 2 -3, level 3 -4 etc as you will quickly be unstuck during a normal correction, and will be extremely painful during a real crash! The reason why is that if the market turns, you will quickly run out of btc balance to DCA if you set such small triggers, and you can end up (as many newbies who use such settings have done) with some disastrously disproportionately large bags. I would set Level 1 to at least -10 or -15 (I sometimes have it as high as -24!) because even on an uptrend it is not unusual for a coin to correct to -10 or more before reversing again. Also when the trend changes, you can’t just guess when it will recover. Sometimes I will leave DCA level 1 on Anderson very large say -20 to -24 so that the vast majority of coins only need a single DCA hit before being sold. Also on occaision I may manually DCA, I do this according to the Ichimoku Cloud (which is not currently a PT strategy, but it is possible it may be in the long term- here’s hoping anyway!) and will only make a single buy when the trend has clearly changed again and is back on the rise. On a 6 hour chart, look at what happened to STRAT during the last month as a clear example. The wisest thing of course would have been to sell it early of course, but most newbies (and even some more experienced PT users- but not me of course, ha) decided to keep their DCA settings on aggressive. I understand there are coins you may believe in and want to keep no matter what on your account… but… you only have to imagine what would happen to someone’s account if your DCA ANDERSON buy triggers are -1, -2, -3, -4 when many alts showed a similar chart crashing for over a month… from STRAT’s peak on January the 15th it has lost around 60% of it’s value. Are my figures beginning to make sense now? Take my advice and think about it and ignore anyone who just throws out random settings. Some of you may have noticed Red Pulse, RPX which as far as I know is a coin with a great future, however it dumped bigtime upon release. When a coin is released to an exchange, typically it has some very unnatural price movements for the first few weeks. I sold RPX before it was going further down (already it was a bag larger than I usually have, I suspect it may have ruined a few people’s accounts who used- yep- aggressive DCA settings) I decided to reduce my position size, and then manually re-enter once it had bottomed out. On PT 2.0, very usefully you will be able to filter coins by a minimum age criteria too (I will show coaching clients in advance of release what I recommend and all the parameter changes). I have at times used the automatic stop loss though most of the time I will DCA intelligently or stop loss manually. It is very easy to get “stopped out” in crypto because of the volatility and frequent number of trades you will perform with PT. One method of using a stop loss I have used is to set it around -12, set a rebuy timeout- where it will not rebuy after firing the stop loss for a set amount of time you set it to in minutes. The paramater would be DEFAULT_stop_loss_timeout = 1440 (One whole day) or DEFAULT_stop_loss_timeout = 2880 (2 days) and then keep an eye on the coin and buy again as it has bottomed. This requires a little more work than DCA and you’ll have to have some experience as a manual trader but it can be effective. For example on my Binance account I have stop lossed (including panic sells) less than 8% of all the trades I have made (which as of April 2018 is around 800 since December 2017). So someone contacted me not too long ago and told me during the crash they managed to get a bag of ICX which not only was -50% in lost value but took up HALF his account, and surprise surprise his ANDERSON was set to small buy triggers like -1, -2, -3, -4 etc!! (somebody from Youtube who he declined to name supposedly supplied these settings) Think about it, how much risk are you holding if a single bag you are holding eats up half of your capital? A bag taking up 15% of my account I will not allow let alone 50%! He added he wished he had read my advice first before setting his levels to such tiny triggers! Profit Trailer also has a trailing buy feature which is where it will look for the lowest possible price, which is the inverse of a trailing stop, explained here on Investopedia. This means if a price keeps on dropping it won’t buy until it reverses at a defined variation you can change. This feature is integrated with most buy and sell strategies. Likewise Profit Trailer has a trailing sell/stop feature, which can be set to a % variation, on the default it’s 0.5 which means if price keeps going up it will trail the stop up so that it only sells at a 0.5% drop. Trailing buy/sell is also integrated with DCA. Occaisionally I have woken up to see sales over the night where the gain was over 50% and the profit on a single trade was $200! Most of my sales are in the 10–15% profit range. Some people prefer lots of smaller trades and smaller gains but I prefer bigger gains and a smaller number of trades and pairs to manage. Personally I prefer using a larger number- the reason why is that I have observed using a tiny number like 0.15 means PT will often sell far too early. The default at 0.5 is fine but I have been testing it at 1 and I’m finding it really does often trail up to a high number much more frequently before price starts to reverse and it puts in a sell order. Think about it, if you have a gain of like 0.9%, and even if a few of them trail up further, lets say your average sales maybe come out around 1.5% in the end which is what a few guys seem to have, how many trades do you need to win to nullify even one deep bag or a coin you decide to sell at a loss? The answer is a lot. Most of my sales are around 10% and a few hit 15–20% or more, and on occaision 30–50%+. This essentially means one of my sales is worth ten, fifteen, twenty etc of the sales done by someone who has 1% gain, think about it. He had a relatively small whitelist. He filtered to trade on coins of only 2700 and above. His max pairs was 12. He traded on 5 minute candles. If you were to graft my settings onto such an account straght away, you would not see an immediate effect, so I told him it was better we phase in some of mine; firstly his DCA log had pairs bought on a completely different timeframe, different strategy and his buy criteria was different to mine. What we did was make some tweaks on his current settings. We did a spreadsheet analysis to look at his last 500 sales and look at the difference between the price sold and peak price reached in the next 24 hours (this is an exercise I conduct with clients), and discovered the Median gain he lost out on was 2.7% and the average gain lost out on was 4%. At first he raised it by 4% and he got some much bigger sales, but less frequent. In the end he wanted to keep his coin profile and baseline buy strategy (though he added a lot more coins on his whitelist) and raised gain to 2.5% from 0.9%, increased trailing profit from 0.25 to 0.75 and started getting a nice number of sales that were bigger too. Another conclusion we are able to reach was that his buy zones were in completely different places to mine. Because I use a large trailing buy, on 30 and 60 minutes- 0.5 to 2 usually, I buy at the lowest point possible. His method was buying and selling quick on the rebound. Being able to trade effectively has nothing to do with picking cookie cutter settings. Hence why you should not “Buy stock settings” or find some random settings some “Guru” has posted and expect them to work great. You actually need to learn how markets work, prices move, the fundamentals of technical analysis like RSI, momentum, price action etc. watch, observe, analyse, tweak. This is what I teach people to do. I only include a selection of lots of settings with my coaching clients as examples of what has worked with me in the past (If you are a treasure hunter, some of my legacy DCA settings have been posted in Discord- hint owning Profit Trailer Feeder is a key to the chest;) though I am planning on releasing some of my legacy settings soon to the public for free anyway via Youtube and or Github) and because 2.0 is imminent, I am constantly tweaking all the time. One additional feature of Profit Trailer is that it will manage the coins you buy manually yourself. And if you already had alts in the account before the bot started, it will calculate the average price if it is less than 30 days old. Any older and you can input the bought price yourself. For any alts you already had, if you want to HODL them, you can switch PT to ignore them, WATCHONLY mode. If you are happy to let PT trade them it will manage them just like any other pair including DCAing them when required. So if you wish to practice manual trading with small amounts, PT can help as a safety net! How will trailing work in 2.0 with combined indicators? Risk management is an absolutely vital skill in any form of investing or trading. Unfortunately many newbie traders and botters haven’t a clue about it and thus their accounts fluctaute very wildly, or their gains can quickly be wiped out. I regard risk management as the cornerstone of being profitable long term and will teach people how to do it a pragmatic way. The best thing overall with Profit Trailer really is that because of its wide range of monitoring and safety features it can really help as a risk management tool. For example, once you get more experienced you could also just use it on semi automatic mode (which sometimes I do) where you do your own buys and it sells or DCAs for you. Because it monitors your portfolio on an exchange (you will have seperate instances of PT and monitors on different exchanges). Another feature I use is the ALL_min_buy_balance_percentage =parameter. This is an important feature as it locks up a % of your base trading currency and not use it except for DCA- you can also lock up a % of your buy balance to allow/not allow DCA too. Let me give you an example, if you set ALL_min_buy_balance_percentage to 50% (which I think is a fairly decent figure to use, but I vary it from around 35–50% depending on the market conditions) it means as your account grows, you keep more btc as a % of all your holdings. For example if your account grows from 0.3 to 0.6 it will lock up that 0.3 btc and not trade with it except use it for DCA (if you allow it to DCA, or don’t set a DCA minimum buy balance). This is a good risk management strategy as this means you are reducing the amount of exposure to risk when the market turns. The nuclear option can be to set it to PANIC SELL. I would use this with caution but it can be very useful once a crash is confirmed, because you can simply save your btc before your alts tank more. However you absolutely need to time this right, if you PANIC SELL at the bottom of the market you have effectively cut off your nose to spite your face. Again some newbies have become unstuck because they were unable to know when a market had bottomed out and panic sold after the market couldn’t go any lower. And guess what? After they had panic sold, altcoins and BTC started recovering. To coaching clients I will explain in detail how I determine market bottoms, and at some point I will be either making a Youtube video or another post about this. Sell only mode triggers will turn off the bot upon certain market conditions. For example you can set the bot to stop buying (there is also a recovery trigger so say it needs to recover by 3% in the other direction before resuming trading) after a certain number of buys without a sale or upon a btc price rise or drop, very useful if BTC is mooning too fast, or there’s a correction. Alts have somewhat of a complex relationship with btc and some alts have almost no correlation to btc whereas others do. DCA Rebuy timeout- this prevents the bot from making another DCA buy within the specified time period, expressed in minutes. I set ALL_rebuy_timeout = to at least 12 hours, (720) but most of the time I have it at 1 whole day (1440) and in bearish markets sometimes 2 days (2880) or 3 days (4320). Most PT users seem to ignore this or have it on something very low like 30 minutes. Again it makes no sense from a risk management point of view to have no or a short rebuy timeout. Think about it, how much safer is your account from being ruined by a bag if you are only allowed 1 DCA buy per pair a day or every 2 days? A lot, and again why my accounts are able to survive harsh market conditions and still be safe unlike the overwhelming majority. A final word about the creator Elroy, who an excellent and very helpful and well organised developer. Many of us have used other bots which had less reliable developers, who ignored bugs or provided poor customer service or we had been left scratching our heads as to why the bot made those buy decisions. Profit Trailer in comparison is a brilliant experience, very stable and it does what you tell it to with no mystery once you understand it’s inner workings. Bugs reported are usually gone by the next release or the one after, it’s refreshing to work with a team which is so streamlined and capable, which can’t be said about the vast majority of other bots I’ve used. 1) How much money can I make? Can I make x% a day? I see this question a lot, and it is well meaning but very niave to assume you can get an exact figure every day. I also see some Youtubers claiming you can turn 1k into a million, using PT or another bot and there are several points I’d like to make regarding this. Firstly markets fluctuate a lot. You may have a number of days of boom like we saw in November and December where people were doing 1, 2, even sometimes 5, 10% a day, followed by a correction. You may have days of lots of sales followed by a few days where the market corrects and you make hardly any or no sales, you just have to ride it out and setup your bot in some of the ways I’ve described when the market turns. You may have a month (I would say the end of February to early March 2018 has been like this) where the market is completely choppy and accounts are stable and neither growing much nor losing much. But overall, my accounts have grown far faster than had I had to trade them alone without PT. Is it possible to turn 1k into a million? Perhaps, but to do that you’d have to compound for a long time, know how to manage the corrections and crashes and accept you will not get 1–2, 3% gain every single day, it’s simply impossible. But on a bull run it will exceed your expectations, possibly beyond your imagination! There is no magic button ultimately, and if someone claims there is, be very sceptical about their claims and dig deeper. Markets move in cycles and you have to learn to deal with the rough as well as the smooth. 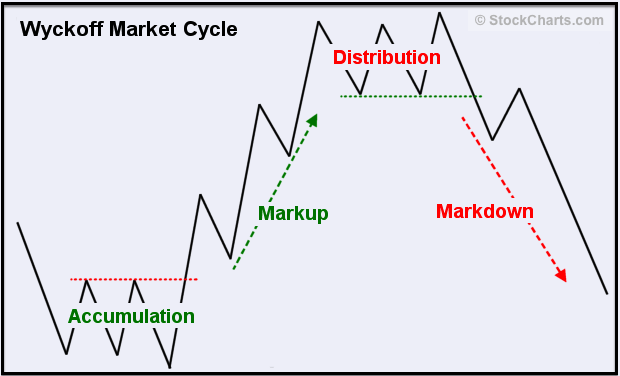 Edit: a very important concept to understand with any form of trading is the Wyckoff Market Cycle. If you understand this, it will make you a much better trader, bot or not. “Rule One: Don’t expect the market to behave exactly the same way twice. The market is an artist, not a computer. It has a repertoire of basic behavior patterns that it subtly modifies, combines and springs unexpectedly on its audience. A trading market is an entity with a mind of its own. This is why I see using PT truly effectively as like being like a General in the army, and you must have a strong defensive strategy as well as a strong offensive strategy as well as being quick to react, these subtle levels of perception will set you apart from the mediocre; it’s what sets apart the outstanding and world class from the decent too. I explain this in more detail to any clients. 2) Is it better to run it on btc or eth? I’ve mostly run on BTC pairs but have now had the chance to do ETH too. My observations are BTC is potentially more profitable but ETH more stable, and with ETH your account will be less prone to fluctuations and bags so you can be less defensive with a DCA or stop loss on ETH and get away with it. I now suggest, if you have the capital to have both an ETH and BTC pair accounts to spread your risk and maybe have 4 bots, 2 BTC, 2 ETH where you can split test your own settings. 2b) How do I run multiple bots on different exchanges, is it one bot that connects to different accounts? No, if you are running multiple bots essentially uou are running copies of each bot, so for example I will have a fresh copy of a new PT folder for each new account I create, and each folder will have it’s own specific API keys and serial port number you have to set. Each bot will have it’s own monitor that appears on the browser tab when you start it up. I have recently recorded a video demonstration with a client who came to see me in person to explain this and will upload it once I get the time. 3) Do I need to get rid of all the existing alt coins I’m currently holding on binance before I start using it? No you don’t as PT will either trade them on your behalf or if you bought them ages ago e.g. more than 30 days it won’t calculate an average price, plus you can stop PT manually from trading on specific pairs if you just want to hodl your coins there or you can have a completely seperate Binance account for the bot. 4) If I don’t use a vps does my computer need to be on all the time for it to work? Yes, hence why it’s best to have a VPS, I use Contabo, who are based in Germany. Binance is also friendliest to IP addresses from the EU, I have occaisionally heard of people in certain countries in Asia and South America having IP problems so one way around that would to have a VPS/Virtual machine with Contabo where it runs 24/7 without you needing to leave your computer on. 5) The PT wiki is currently offering a vps with PT preinstalled for $20\month. Is this worth it for someone that wouldn’t have a clue how to link the 2 otherwise? 6) I’m only going to have a starting balance of $500. Is it worth it. Am I likely to see any sort of worthwhile returns? 7) If the market crashes, what do I do? First of all there is a difference between an entire market crash, and altcoin (but not btc) crash and a short pullback i.e. a temporary correction in the market. PT will deal with moderate pullbacks, and even many altcoin crashes quite well so long as your DCA is set to quite cautious levels like I described previously or you panic sell as soon as the crash is confirmed. Let me give you an example, during November and mid December 2017 when BTC super-mooned from 7000 USD to 10,000 and then again from 10,000 eventually to 20,000 by the end of Dec there was an Altcoin crash initially in November because people were selling their alts quickly to buy BTC as it was shooting up very fast. People dealt with it differently in the PT community, some people used the PANIC SELL button (which force sells all your alts quickly one by one), whereas on my Bittrex acount (I had yet to sign up to Binance, I started there on the 15th of Dec) I decided to sell some manually (primarily the coins I didn’t rate) and DCA some others (the ones I rated and felt had strong fundamentals), so all of our accounts took a fairly big hit, but within 3 weeks my account not only had recovered to the exact btc value it was before the alt crash- it was now worth a lot more because BTC was now worth 10k! There is also a difference between an altcoin crash and an entire market crash. The crash of Jan- Feb 2018 was an entire market crash where everything went down. I did use panic sell during that one, because the bad news was relentless and really should have used it earlier, but it was still enough to save myself a fair chunk. I also temporarly moved a portion of BTC to GDAX so that I could sell for fiat- I am reluctant to use USDT because as you may well know the recent crash was in part down to the fact people were worried that Tether was not backed by real USD- and until USDT is in the clear (I am not saying they are definately cooking the books- but they have some unanswered questions) I would be very weary of using it instead of real USD, EUR, or GBP and then buy it back once I figured the market had bottomed out. You can also set buy strategy to Positive EMASPREAD, buy value of say at least 0.5 to 0.75 and in INDICATORS file set EMA length to 3600 seconds (1 hour) and increase the length of EMA1 and EMA 2 to 30 and 15 (this method actually also works well just as a buy strategy anyway!) which means nothing will buy until it’s back into a clear positive uptrend, and using a longer EMA timeframe and larger numbers means the bot is less likely to be faked out by minor reversals before continuing down. 8) Do you ever turn the bot off? Rarely, but only briefly to update to a new version. Even during a crash, say after you have panic sold, your SELL ONLY MODE Triggers (e.g. BTC has dropped in value by more than say 10% in the last 24 hours- this number can be defined) plus using the 1 hour positive EMASPREAD method will be enough to stop PT from trading until a recovery is seen. 9) What is better Binance, Bittrex or Poloniex? My account has grown the most on Binance. However on some days and weeks Bittrex does outperform Binance, and some people have said to me Bittrex is better. If you have the capital you could have bots for both. Also once you have a license exchange you can have multiple bots trading different base currencies e.g. one bot for btc pairs, another for eth pairs. On Poloniex you can also trade XMR (Monero) pairs. 10) What about security, is it safe? There was a recent hack attempt on Binance. Luckily the Binance team prevented withdrawals from the fraudsters and are implementing refunds for fake trades. Most of the people hacked have never used a bot, and there was no PT user I spoke to who had lost funds, Binance has since confirmed that the attack was down to Phishing. There are several things you should do to up your security whatever you do in crypto. Use 2 factor authentication (2FA) on all your crypto accounts. All exchanges have this as an option, and if you don’t have it switched on, it’s like not having a lock on your front door. On Bittrex you can restrict IP addresses for trading and withdrawals. 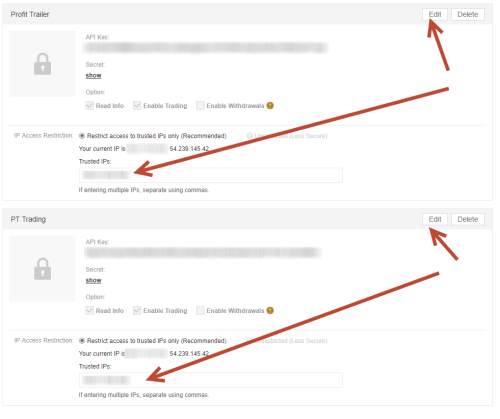 Simply go to account settings and put your home/work IP into the whitelist (i.e. allowedIP addresses you can access accounts from) and also add your VPS IP address you have your bot on to it. 4. Use a phishing blocker such as Metamask, Comodo, Avast, Malwarbytes. These are all free and are good anti virus programmes. 5. Use a Sandbox to run programmes with sensitive information- a sandbox basically virtualises any process on your computer so that it’s isolated, and even if someone has hacked you they won’t be able to see what you are doing inside the sandbox. I use Avast Sandbox which works on the free version, Comodo has a free sandbox feature too. For example you can access your Remote Desktop VPS using a Sandbox and also setup Microsoft Word and Excel, or for that matter any area of your computer to run in a sandbox only. 6. Finally, use a hardware wallet to store your coins and profit withdrawals. My preferred choice is the Ledger Nano which is the most popular brand. If you are not using a hardware wallet, you are leaving your money potentially in the open. No one can access your wallet because it is like a physical safe key and without physical access to it and the keycode, no one can take your coins. It is also integrated with MyEtherWallet and upon startup it will create MEW addresses for you for your ERC20 tokens. All the strategies and settings are explained in detail here. Go here to buy Profit Trailer. Click here to sign up for Binance, the most trustworthy and profitable exchange. Binance has an amazing number of coins with huge potential, and the CEO has appeared in the media (he was recently featured on the front page of Forbes printed edition)! and they support a lot of Blockchain projects and startups. Sign up for Tradingview, the best charting service on the internet. Coinigy is also a great charting service. Profit Trailer feeder is a very popular addon to PT which can dynamically adjust your settings in different volatility, market conditions helping you create a system that switches buy and sell strategy according to what the coin or market is doing. The PTF settings I use now put many of the settings I’ve described together into a superfile. I know both the creator Mehtadone (we actually live near each other in London!) And the guy who does the demonstrations in the PTF videos, J-Rod, who is one of the founders of Cryptoprofitbot official distributer of PTF. I have recently met Mehtadone in person and we have recorded a tutorial on PTF 1.5 plus a half hour interview behind the history and purpose of PTF! Click here to watch aworld exclusive- the first ever interview with PTF’s creator Mehtadone where we spend 40 minutes looking at a PTF config file! Note that PTF is developed by an independent team of advanced PTF users and if you want support or help for that you will need to visit the PTF Dischord group rather than the PT Discord group. It will adjust the buy amount, trailing buy, buy strategy of a coin based on various profiles you setup. For example if a coin has been tumbling sharply for the last day, I will use a threshold such as downsidevolatility, longtermpricechange (there are numerous measurements you can use) to change the buy strategy, maybe reduce gain and sell thresholds and in some cases I will set it so that it will not even look at buying a coin (overrides to sell only mode) until this coin stabalises (you can set different layers of threshold levels), or if you already have it, and shows an unnaturally large downwards profile it will stoploss it rather than DCA. In some cases such a coin may actually be in significant trouble. For example CENTRA the coin shilled by Floyd Mayweather (I’m not having a go at him, though he probably didn’t do his own due dilligence and may have been paid to promote it…) tanked sharply after their CEO was arrested on fraud charges. If you were not using PTF and if you had been using dangerously shallow DCA levels, your account could have been ruined because it was treating it as any other coin, and yes I did speak to people who lost weeks worth of profits because their bot decided to DCA Centra! To shallow DCA a coin like that is absolute suicide. On the inverse, if a coin is uptrending you may want to reduce trailing buy and the buy strategy, buy triggers, gain level, maybe the buy amount etc. There is a lot more PTF can do, the list is almost endless. I keep repeating managing risk is vital in trading and PTF allows you to do that to a very detailed level. Edit I just recently created a new thread on Bitcointalk. If you have a question for me this is now the first point of call as I’ve been getting far too many messages and emails I simply can’t keep up with them, and I’ve decided I might as well allow everyone to see a wider range of questions and answers in one place. If you want to know my exact settings and advanced strategies I’m offering a very limited number of people a coaching service- note that I’m super busy and don’t take many people on- EDIT- I am both in the PT 2.0 beta testing team now plus have been contacted by some potential business partners to develop a more wide reaching programme, so I may ask you to wait for a bit- but feel free to contact me. I have also been asked by a couple of people would I be willing to do a physical live one to one fast track training day and I am considering that too, (I am also looking to audio record sessions so that I or a client will have a record) which includes advanced Trading View/chart training. I do not sell settings alone or as packages as I believe without the understanding why I have made them the way they are, and what to change in different conditions, it’s a bit like giving a rookie racing driver (Formula One, Indycar!) a car configured a certain way without knowing how that driver drives, what experience they have, what level of understanding they have of this kind of setup. You can probably guess what most of my effective settings are from the article anyway- at some point I’ll be releasing a Youtube video and will probably release many, or all of these for free anyway so that people can comment or discuss their effectiveness and their experiences with them. -An initial hour session (either on the phone, or sjype depending what country you are in) where I get a guage of your general level of understanding of PT, markets, trends, price action, indicators, candlesticks etc and we work to set out a roadmap to fill in the gaps. -I find out if there’s a particular method you would to trade with. I will show exactly all the methods I use plus their logic, and you can apply it or you can create a hybrid of your own. For example do you prefer lots of short quick scalps or do you prefer slower smoother movements and bigger gain%? -Having the right attitude and expectations. My belief is that if you take the attitude of wanting to learn everything you possibly can, constant improvement, marrying the technical and the mental that is the way to succeed. Let me use a sports analogy- you could hire an Olympic coach, but if you don’t have the desire yourself to be the best you possibly can and apply everything as well as reviewing your progress and finding your own solutions your chances are reduced. When I started on this journey one of the difficulties I had was finding there was so much noise and contradicting information out there. What is the best bot, what do the settings do, what are some effective professional trading strategies & how can you automate them, what should I do when the market tanks, are there patterns in price movements that repeat over and over, how can I tell what the trend is or when it might reverse again etc. I set out to learn all this from more experienced people and reading until I got some answers. That is what I aim to do for anyone who wants to work with me. EDIT: I’ve returned from Jury Service now, but it took me a number of weeks to reply to people. I will am in discussions with Blitz, Squiggles, and CryptoProfitBot about doing a joint coaching service where we offer a range of advanced users knowledge in a special area (the discussions are still at a very early stage) so I will be phasing out at least part of my coaching programme and integrating it into a joint offer With Blitz, Squiggles and some others, so that . Please subscribe to my Youtube channel for more announcements at a later date- I will also be uploading a lot of free premium content on my channel when I finally have the time to edit it- I have hours worth of stuff I recorded with people who did 1 to 1 sessions with me, stay tuned. I am also offering some free consulations to explore where you are and- and can arrange a 15–20 chat on Skype (in a limited number of countries like UK, some EU, USA, Canada) or on the phone by appointment.